The Paper Steps are a reference guide to help you organize the many aspects of environmentally responsible paper, and a criteria for designating leadership products in the marketplace. Paper buyers can use the Paper Steps see where the paper they currently purchase falls in the hierarchy. Next, set a goal for moving up the Steps, and then learn which brands of papers on the market are at the top of the Steps. You can find a powerful resource for discovering paper products designated as category leaders according to the Paper Steps criteria in the EcoPaper Database, a joint project of Canopy and the EPN. Look first for post-consumer recycled (or de-inked) content, but then look for pre-consumer and agricultural residue content. When virgin fibre is needed it must be free of Ancient and Endangered Forests and come from a Forest Stewardship Council certified forest area. Combine any of the 4 Fiber Attributes to reach the minimum percentage threshold designated for each Step. For a brand of paper to qualify for that Step it must ALSO meet the conditions of the Minimum Criteria which includes the paper’s pulping and bleaching technology. The Paper Steps are a guide and situations may vary. 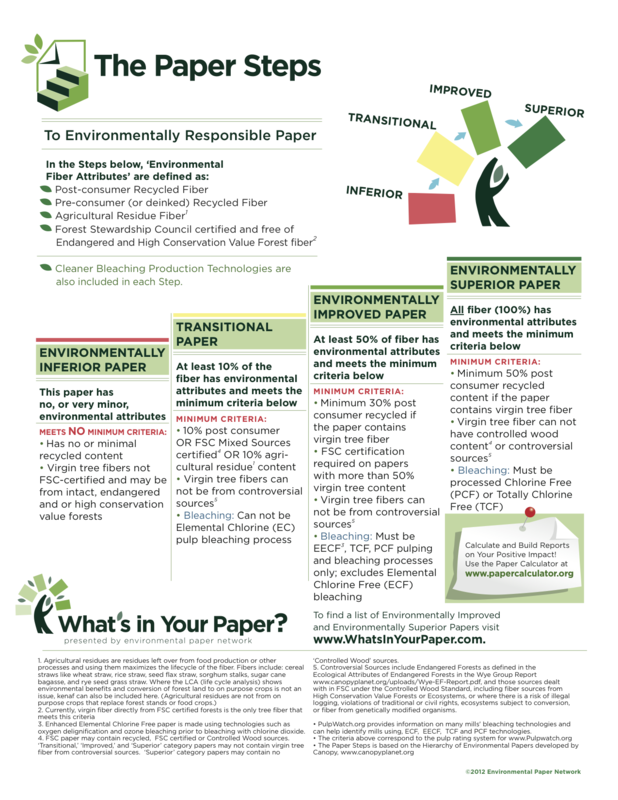 Use them as a part of our complete Toolkit for creating a successful transition for your office or company to environmental leadership through responsible paper purchasing. Find category leaders in North America with the Eco Paper Database. If you need help, contact us.